Why Service your vehicle here, at South Dade Toyota of Homestead? The average new car costs more than $28,000, so consumers can’t afford to rely on anyone other than a top tier professional. South Dade Toyota of Homestead offers the highest level of technician training, state of the art equipment and factory specified parts. South Dade Toyota of Homestead and the manufacturer spend considerable money on continuous training to ensure that technicians are up-to-date on today’s increasingly complex vehicles. Most of our technicians are certified by the National Institute for Automotive Service Excellence (ASE). Today’s technicians must be electronics experts as well as good mechanics. South Dade Toyota of Homestead is continually participating in education programs that can keep our team up to date. Some diagnostic equipment for today’s automobiles can cost over $100,000. Only franchised new car dealers, like South Dade Toyota of Homestead, are required to purchase and use the equipment and maintain computer links to factory service experts. Only new car dealers like South Dade Toyota of Homestead, are required to carry an inventory of parts to cover all repairs to the cars and trucks sold, assuring customers quick repairs and genuine parts. South Dade Toyota of Homestead reputation depends on customer satisfaction, that’s why we guarantee all repairs. In addition, original parts also carry additional manufacturer guarantees. Furthermore, dealers are held accountable to customer feedback, those surveys you get after an appointment are very important! To ensure convenient service, South Dade Toyota of Homestead offers extended service hours that include nights and weekends, express service lanes for routine maintenance and simple repairs, guaranteed time of delivery, often shuttle services and sometimes loaner cars while repairs are being made. 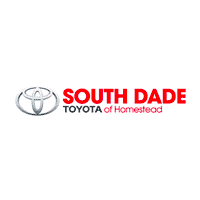 South Dade Toyota of Homestead has service priced competitively. South Dade Toyota of Homestead offers the best service with the best value for your money. In South Dade Toyota of Homestead,customer satisfaction is the primary goal. The best way to achieve this is to offer the best service support for your car at the best price.